Really Sciency: What Hansen et al got right decades ago. A look at Climate Change and its portrayal in the media. What Hansen et al got right decades ago. Dr James Hansen gave a recent TED talk; ‘Why I must speak out about climate change’. Hansen like many scientists is not a natural orator. He comes across as quiet, dry and even shy and nervous, hiding under a hat and referring to his notes constantly. Having said that, his talk is worth every minute it took to watch, he gives an overview of how he went from studying planets for NASA to Earth's climate, and why he has become an environmental activist. None of that however detracts from a good overview of his work, the science, and his concerns. Early on in his talk he mentions a research paper published in Science from 1981; ‘Climate Impact of Increasing Atmospheric Carbon Dioxide’, J. Hansen, D. Johnson, A. Lacis, S. Lebedeff, P. Lee, D. Rind, G. Russell. I thought I’d take a closer look at the paper because it seems almost forgotten, with most deniers concentrating on Hansen in 1988, the year of his well-known Senate testimony, which included the three scenarios that deniers try to claim were hopelessly wrong predictions. They don't seem to know or want to know the difference between a scenario and a scientific prediction. But having looked at this 1981 paper you realise that it must have formed a core part of his work that led him to being chosen to give testimony in front of the Senate. The whole paper seems uncanny in what it suggested the climate in the next few decades and into the 21st century would look like. The first thing to notice is that there are a lot of caveats and even some statements that some could claim are contradictory. This isn’t fudge or hedge betting but an honest summary of the uncertainties that existed in the science over thirty years ago. The IPCC, established in 1998, confirmed in its third assessment report in 2001 that ‘There is new and stronger evidence that most of the warming observed over the last 50 years is attributable to human activities’, and by the fourth, "warming of the climate system is unequivocal", and "most of the observed increase in global average temperatures since the mid-20th century is very likely due to the observed increase in anthropogenic greenhouse gas concentrations." The team was also spot on about warming in the 80s and beyond. This was only a few years after the media frenzy in the 70s about a coming Ice Age and most people probably thought that was more likely even if the scientists knew better. For any climate deniers this must seem like a very lucky guess, but there is a reason why these people were picked to do research for NASA. The paper also states; “Potential effects on climate in the 21st century include the creation of drought-prone regions in North America and central Asia as part of a shifting of climatic zones”. Hansen et al, predicted the “opening of the fabled Northwest Passage.” This was a hell of a call at the time. “Floating polar sea ice responds rapidly to climate change. The 5° to 10°C warming expected at high northern latitudes for doubled CO2 should open the Northwest and Northeast passages along the borders of the American and Eurasian continents. Preliminary experiments with sea ice models suggest that all the sea ice may melt in summer, but part of it would refreeze in winter”. To most people at the time this must have been seen as alarmist. Hansen states in his recent book 'Storms of My Grandchildren', (Which the video talk seems mostly lifted from), he believes he lost some funding in 1981 from the US Energy Department because this paper was considered too alarmist. Which flies in the face of 'skeptic' claims that scientists are being deliberately alarmist just to garner funding. But the papers prediction is exactly what has happened, with that passage and it Eastern sister are now open at least part of the time in recent summers. At least one scheduled cruise liner (the MS Bremen in 2006) has successfully run the Northwest Passage. If the most recent research about lack of ice causing a shift to the jet stream, and making colder winters is accepted – this is another accurate prediction. This papers also states that “Climate models predict the larger sensitivity at high latitudes and trace it to snow/ice albedo feedback and greater atmospheric stability, which magniﬁes the warming of near-surface layers. Since these mechanisms will operate even with the expected rapidity of CO2 warming, it can be anticipated that average high-latitude warming will be a few times greater than the global mean effect”. This is exactly what has been detected with the Arctic warming several times faster than average. “Melting of the world’s ice sheets is another possible effect of CO2 warming. If they melted entirely, sea level would rise ~ 70 m. However, their natural response time is thousands of years, and it is not certain whether CO2 warming will cause the ice sheets to shrink or grow. This is another good call because recent research and data from the Grace Satellites do show that over all ice sheets and glaciers are melting but in a few areas, such as the internal of Antarctica and the Himalayas there is increased snowfall and ice build up. Over thirty years later, UN COPs discuss actions needed to try and keep temperature rise to under 2C, a temperature the paper suggests will cause 5C warming in Antarctica, but without much success so far and it seems that keeping future warming down to such a limit is becoming all but impossible and not without the end to massive coal burning. Was right about the 1980s warming, even though this was just after the media frenzy about a coming ice age. Was right about erosion of ice sheets, rising sea levels and opening of the fabled Northwest Passage – a pretty good call. Was right about warming at higher latitudes being greater than the global mean. Was right about the increased growing season. Was right about increased snow fall and net ice sheet growth – yet 'skeptics' today still use this as an argument against global warming. Was right about a partly ice free Arctic modifying neighbouring continental climates – if the most recent research about lack of ice causing a shift to the jet stream, and making colder winters is accepted – another good call. Appears to be right about 2C warming being reached within a century and that temperature being the accepted limit before irreversible and detrimental effects occur. There is nothing obviously incorrect in this paper. All this was predicted using models that according to 'skeptics', are not supposed to work, over 30 years ago in 1981, the year IBM released it’s first PC with Microsoft MS DOS. You have got to give this man and his team some credit for saying all this when most people thought we were still expecting an ice age. 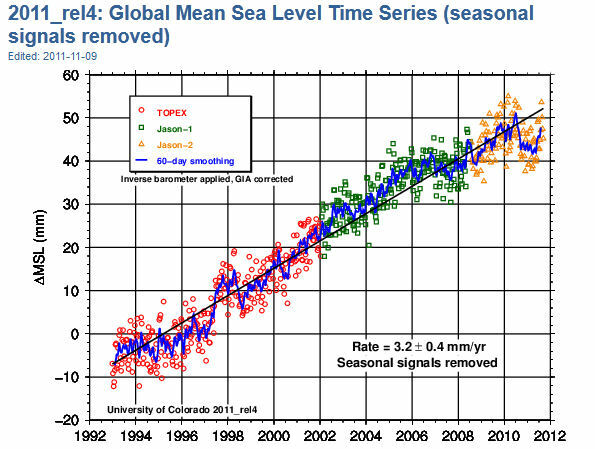 This is either good science or, if you reject AGW, they must have been very, very lucky. Personally I think I know why they were employed by NASA.
" 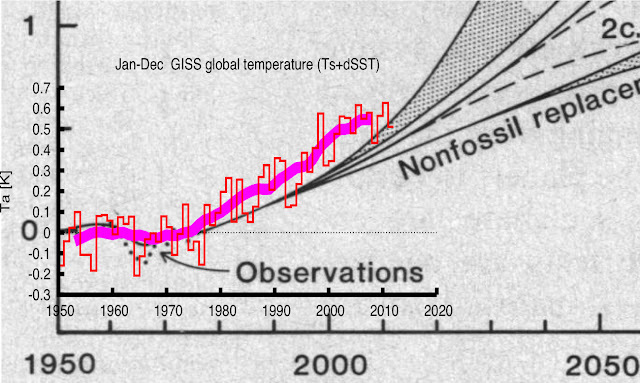 a projection from 1981 for rising temperatures in a major science journal, at a time that the temperature rise was not yet obvious in the observations, has been found to agree well with the observations since then, underestimating the observed trend by about 30%, and easily beating naive predictions of no-change or a linear continuation of trends. It is also a nice example of a statement based on theory that could be falsified and up to now has withstood the test. The “global warming hypothesis” has been developed according to the principles of sound science." How does the increase in urban land use equate to equivalent Gt of anthropogenic CO2? i.e., If you increase the urban albedo by 0.1 % ~= 100-110 gt CO2? So, why not whiten the roof tops and roads, etc. "The major difficulty in accepting this theory has been the absence of observed warming coincident with the historic CO2 increase." I've only been observing climate change debate and considering the issues involved since 1988. But I am astonished that as observations arrived to confirm the theory it is still rejected by so many who would claim to be leaders of this civilization. This really was published at the height of the 'Global Cooling' media hype and when global temperatures had been falling but Sawyer not only predicted a reversal of this due to rising anthropogenic GHG's but seems to have pinned the rise and climate sensitively very accurately. Perhaps if Hansen had referenced this his paper would have been even more accurate. Steven Goddard And His Sea Ice Recovery!